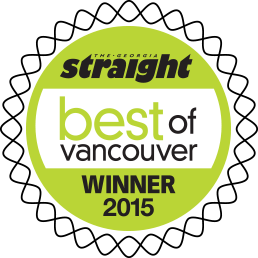 Man cleared in washroom assault - Patrick C. Fagan, Q.C. COURTS – A former McDonald’s employee has been acquitted of sexual assault for allegedly fondling a 28-year-old man in a washroom of the downtown restaurant nearly three years ago. Provincial court judge Gerald Meagher, noting the complainant was evasive and argumentative, said it would be dangerous to enter a conviction against the accused 27, for the alleged incident on Feb.03, 2003. 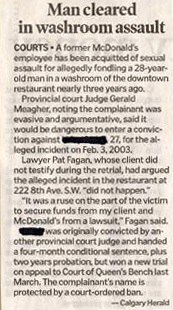 Lawyer Pat Fagan, whose client did not testify during the retrial, had argued the alleged incident in the restaurant at 228 8th Ave. S.W “did not happen”. “It was a ruse on the part of the victim to secure funds from my client and McDonald’s from a lawsuit”, Fagan said. The accused was originally convicted by another provincial court judge and handed a four-month conditional sentence, plus two years probation, but won a new trial on appeal to Court of Queen’s Bench last March. The complainant’s name is protected by a court-ordered ban.